An unforgettable experience of breathtaking natural beauty in the pristine waters of the Pacific Northwest. The Kestrel is our new high-speed adventure vessel-- perfect for anyone looking for an exciting excursion! For over 20 years, San Juan Safaris has been offering the highest quality whale watching tours with a focus on our guests’ experiences and respectful wildlife viewing. 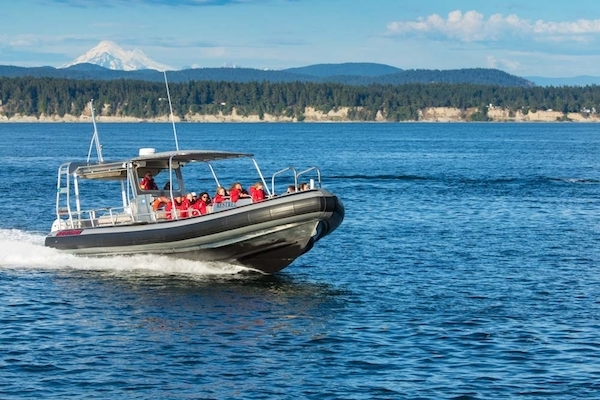 Experience orcas, seals, sea lions, eagles, and more from the comfort of our safe, fast, and US Coast Guard approved vessels. With four vessels and multiple daily departure times, there’s sure to be a tour that’s right for you. Our seasoned Captains will keep you safe while aboard our vessels and position the boat in prime locations for whale and wildlife viewing. 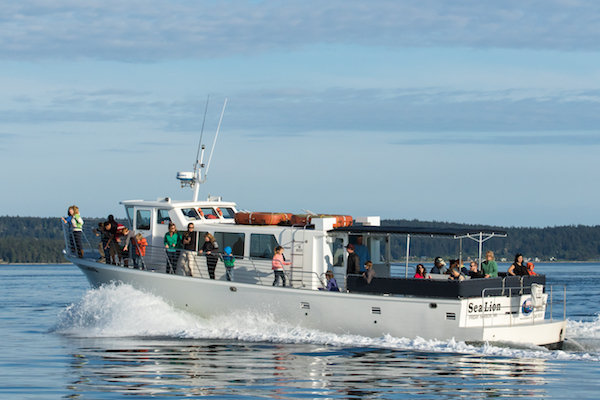 All of our tours are staffed by seasoned Captains and passionate Marine Naturalists who will teach you about the wildlife, ecology, and geology of the Salish Sea. We encourage you to ask questions and love to share stories about orcas and the local area. 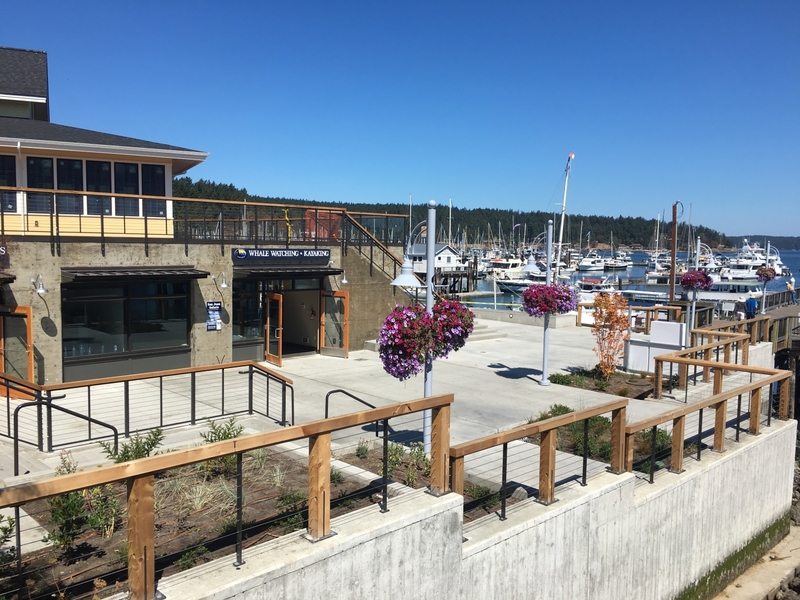 Our brand new Whale Watch Headquarters is located just feet from the ferry terminal in Friday Harbor, and steps from local restaurants and shops. Stop by and say “hello” to learn more about our tours and the best spots on San Juan Island to explore. Visit our retail and gift shop for the latest in northwest guide style. Don’t forget to stop by our new Ridetide Café for coffee, sandwiches, desserts, and more! 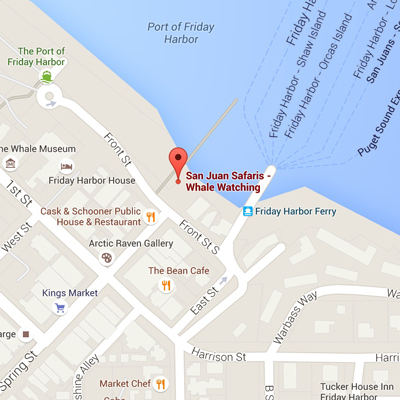 No whale watching tour does more to help their guests see whales than San Juan Safaris. For over 20 years, we’ve worked closely with conservation groups to monitor the locations of orca whales. 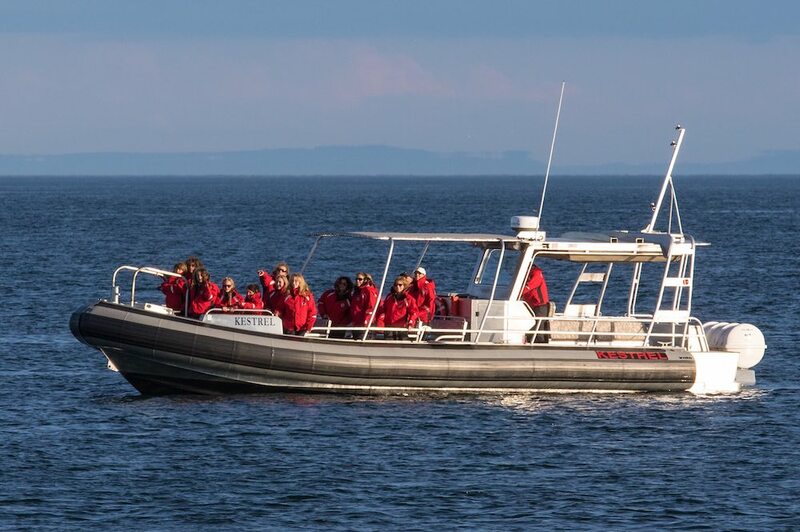 With the help of our fast boats and experienced captains, we can travel further and faster than other tour groups. The proof is in our results. Over 95% of our tour groups see whales, more than any other tour operator. But there’s more to your trip than simply seeing whales. 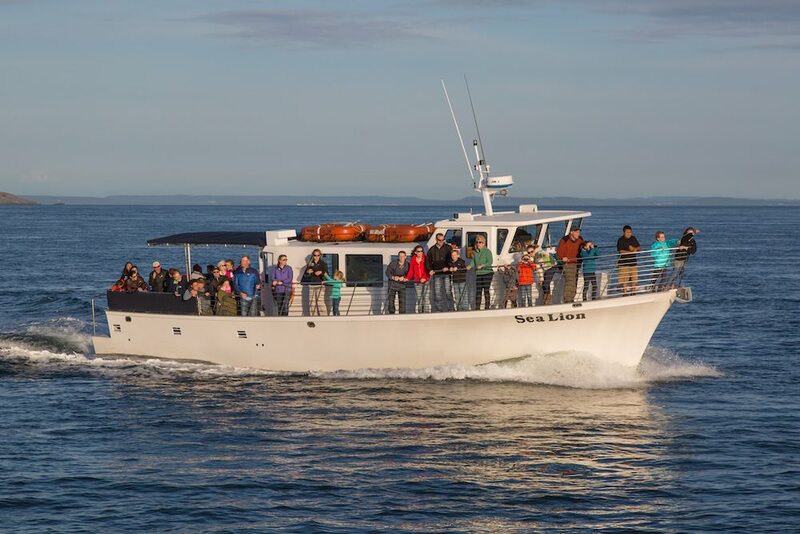 All of our whale watching tour groups are accompanied by a marine naturalist who will help you develop a deeper appreciation for the environment and wildlife of the San Juan Islands. We hire only the best and brightest naturalists. Their enthusiasm and passion is truly infectious! They’re part teacher, part environmental advocate, and part entertainer. You’ll learn, laugh, and leave your tour with a smile on your face and memories of a day you’ll never forget. Fewer than 40 guests aboard each tour. There’s plenty of room at the rails or in the heated, windowed cabin for everyone and you’ll never feel crowded. Complimentary rain jackets, binoculars, blankets and other amenities to help you enjoy your adventure. The utmost respect for the wildlife we see and the local ecosystem. We believe in observing but not interacting with orca whales. We’re committed to ensuring that the San Juan Islands remain the #1 place to see orca whales. There’s nowhere else in the world quite like the San Juan Islands. Located just a few hours from downtown Seattle by car and ferry (or an even shorter plane ride), the San Juan Islands are home to a thriving population of majestic orca whales. Orca whales live, play, and raise their young in the waters of the Haro Strait near San Juan Island, Washington. In the spring, summer, and fall they ply the calm, cold, clear waters of the San Juan Islands, following the schools of Pacific salmon that are returning to the rivers where they were born. From mid-April until the beginning of October there’s just no better place to see orca whales than the San Juan Islands. In addition to whale watching, there’s plenty to do in Friday Harbor and the rest of the San Juan Islands, including sea kayaking, hiking, and biking. You’ll also find plenty of local farms, vineyards, and local farm-to-table restaurants to visit! Visit Lopez Island or Orcas Island for a fun day trip! Enjoy delicious locally caught halibut, salmon, and crab at one of the many local restaurants. Ask us how we can help you plan a trip you’ll never forget! "Best for: Orca whale watching, porpoises, seals, minke whales, and bald eagles. "Washington State's San Juan Islands, celebrated for the spectacular wildlife-viewing opportunities they afford. The San Juan Islands are the best place in the world to view killer whales, and viewing them from a kayak is an experience like none other. 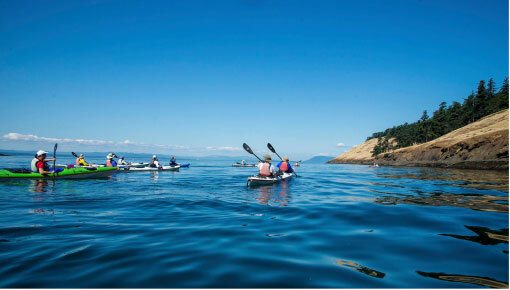 Our sister company San Juan Island Outfitters offers multiple sea kayaking tours daily, no experience necessary.